I had a beautiful dust ruffle on my bed. 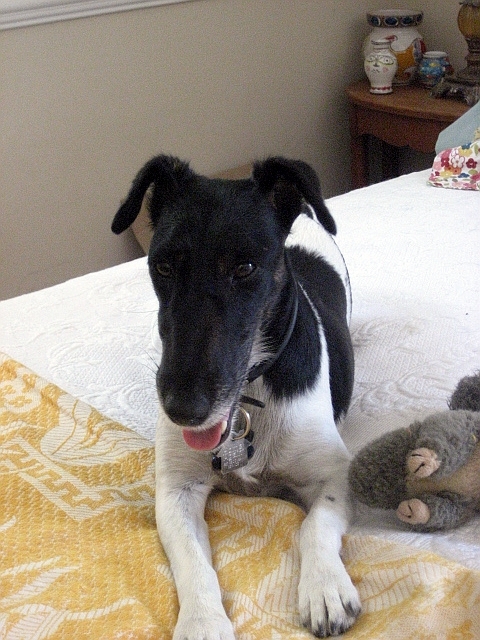 I say had because my sweet, loveable fox terrier Wendy decided today was to be a naughty terrier day. Previously she had ripped a chunk out of the dust ruffle, and I was trying my best to ignore that since it was on my husbands side of the bed! She throws her toy under the dust ruffle and then battles the ruffle to get it out. It’s just a big ripping, shredding game to her! Today while at work she was such a naughty dog! Well, that dust ruffle is toast now. But I was bored mom, and you were at work. So there! A perfect occasion for a round of the Terrier Song, remember those guys from Kids in the Hall! If you want your love to grow. 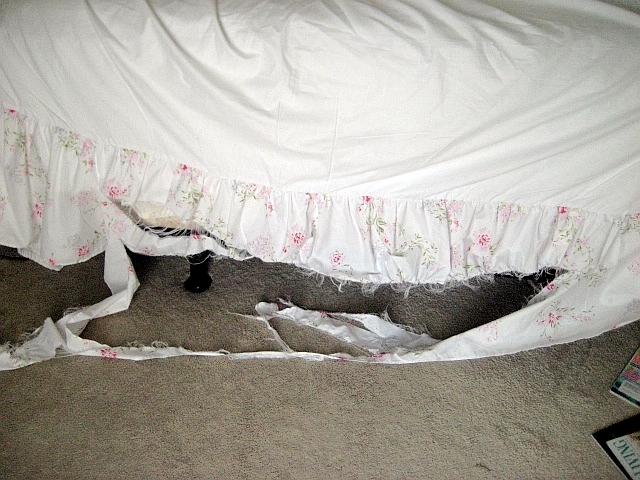 Oh yeah, I used to have a naughty terrier as well. He’d cram his tennis ball under the sofa behind the ruffle then dig at it. 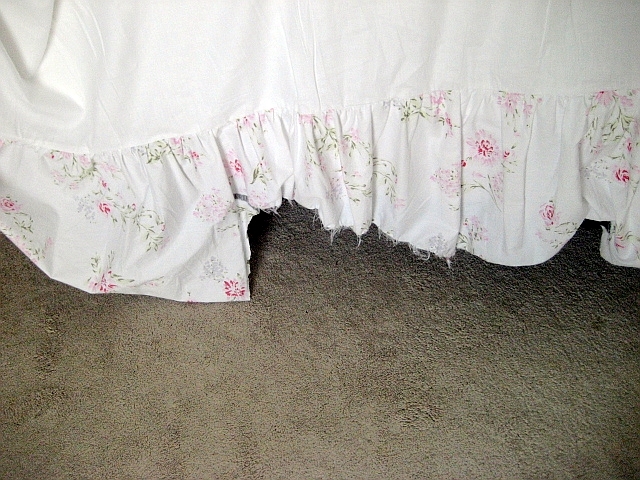 Sofa skirt was a goner. But oh how I loved that do. Naughty, but look at that cute face. Rut Ro !! !What a stinker!!! It could be worse: I had a rat terrier named Simon that decided he wanted to chew a hole in the wall! One look at that face, and all angry thoughts are gone. What a cutie! What an innocent face! What are ya’ gonna’ do when they look at you that a’way? Oh nooo!!! It looked like a beautiful dust ruffle, hopefully you can salvage parts of it for fabric now…. My mother in law had a pup years ago who decided my favourite shoes that I bought in Italy and had at that point been my most expensive purchase as a student would be a delicious dinner, could have killed her! but she was way too cute…. LOL! Well, she certainly gave you a bold reminder of who runs the show! Isn’t it funny how being a dog lover is almost an affliction? For people who genuinely love dogs, it never matters what bratty thing they do, they are still as welcome as our children. Look at Wendy’s face…..she knows she can get by with anything! awwwww……but how can you stay mad at that face!